In recent months, legislators in California have begun a concerted effort to use state law to address the state’s ongoing housing crisis. The moves come amid worsening regional inequality that has pushed housing affordability outside the reach of many populations. Facing mounting pressure from a growing cohort of pro-housing YIMBY activists and increasingly grim economic and social impacts—including a sharp increase in the number of rent-burdened households and the number of individuals and families experiencing homelessness—state-level legislators have begun to take action where municipal leaders have thus far stopped short. Late last year, the California State Legislature approved a bundle of housing-focused bills in what amounted to the first key win for state-led housing reform efforts. The legislature passed a total of seven bills aimed at streamlining permitting, enforcing regional housing production benchmarks, and preventing municipalities from down-zoning parcels or rejecting by-right projects. Several of the bills also aimed to stimulate new housing spending for affordable units, including a measure that will allow for a low-income housing–focused $3 billion bond to go onto the November 2018 statewide ballot and a measure that institutes a modest levy on certain real estate transactions in the state in order to raise up to $250 million each year for low income housing construction. The two combined measures could make over $8 billion in new funding available for affordable housing production over the next decade. These bills followed the adoption in late 2016 of a streamlined Accessory Dwelling Unit (ADU) ordinance that legalizes backyard homes across the state while also providing minimum zoning standards for ADUs that homeowners and developers can follow when local rules do not exist. The shift has led to a surge in ADU applications across California’s big and small cities alike, as homeowners move to build new ADUs while also legalizing existing bootlegged units. In a blow to NIMBY activists, the move also essentially doubled the residential density of the state’s single-family zoned lots overnight, with the added benefit that ADUs developed in certain areas—historic districts, ½-mile from transit—could be built without added parking. A recent report from the University of California, Berkeley’s Terner Center for Housing Innovation concluded that “ADUs are poised to play a significant role in alleviating California’s housing crisis and state, regional, and local leaders should continue to examine ways in which barriers to this type of development can be removed.” The report cited an explosion in building permits for ADUs following their legalization, with 1,980 units pending in Los Angeles for 2017 compared with just 90 the year prior. Efforts are currently underway to continue to streamline ADU development at the state level. Hopes of using state law to right California’s housing market were boosted further this year by the introduction of SB 827, a transformative new state law that would, among other things, override local planning code to raise height limits and boost density while abolishing parking requirements for lots located near mass transit. The bill is authored by State Senator Scott Wiener—one of the authors of several of the 2017 housing bills—and has the backing of many of the state’s increasingly influential pro-housing activists. Specifically, for properties located within ¼ mile of a transit corridor or one block from a major transit stop, the bill would disallow height limits lower than 85 feet, except for when a particular parcel fronts a street 45 feet or less in width, in which case the minimum height limit would drop to 55 feet. The bill would also forbid height limits below 55 feet for all areas ½ mile from transit routes. The law, if passed by the legislature and signed by the governor, would also forbid the imposition of minimum parking requirements for parcels within a ½-mile radius of a transit stop or within a ¼-mile radius from a transit corridor. One of the bill’s strengths is that these provisions lump high-performing bus routes in with light and heavy rail infrastructure, making their potential effects across the state quite vast, as many of its major cities have extensive bus networks. Wiener’s bill is seen widely as a potentially earth-shattering piece of legislation that would upend decades’ worth of ever-tightening local control—often at the expense of density and new construction. The abolition of parking minimums in particular would represent a sea-change in car-loving California, where parking takes up a lot of space and significantly adds to the cost of building new housing. Policy Club, a collective of digitally-savvy professionals who aim to utilize data to help politicians craft “smarter public policies that will move the needle on some of California’s most pressing challenges” has generated a visualization that postulates what some of the changes in density, parking, and maximum height might look like for the City of Los Angeles. Hunter Owens, a Policy Club contributor, explained that, at least in L.A., parking reductions associated with the bill will do the most to change the way the city builds in response to the bill. Owens said, “We were surprised to find that it’s the parking requirements that are keeping building heights and density down,” adding that many potentially affected areas in L.A. already benefit from lenient height limits. Doing away with parking requirements would allow housing developers to build more of the units they are entitled to build and make for a more efficient use of land, the maps show. The group is currently working to digitize city planning codes from across the state in an effort to create more visualizations. Another potential benefit from the bill would be the dramatic increase in the number of new sites where deed-restricted affordable housing units could potentially be built if SB 827 and the affordable housing bond pass later this year, according to Brian Hanlon of California YIMBY. SB 827 would permit nonprofit developers to build affordable housing in many so-called “high-opportunity” areas throughout the state that currently prohibit dense development. 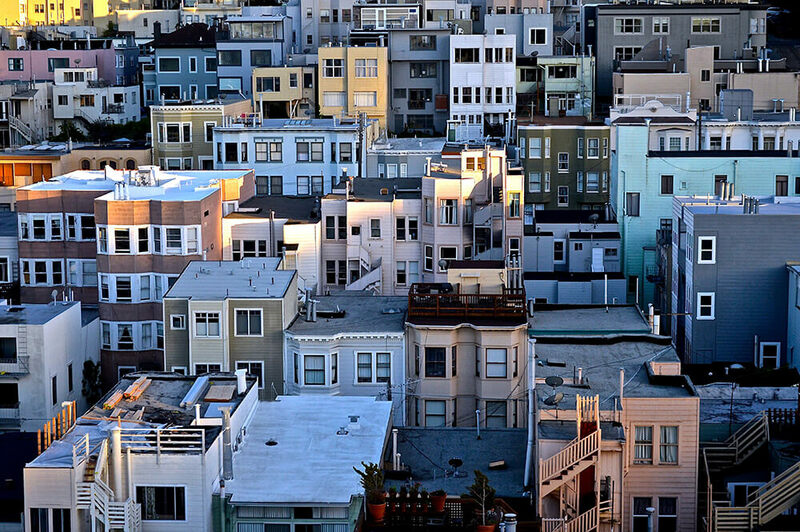 The bill would also dramatically expand the production of deed-restricted affordable housing in cities with inclusionary zoning policies, since building market-rate homes also requires providing homes for low-income Californians, Hanlon explained. These changes could make deed-restricted affordable housing an additional major force in resolving the crisis by incentivizing—rather than requiring—inclusionary development along transit routes. That component as well as the other provisions of the law could generate “millions” of potential new units, according to Hanlon’s early projections. Though official estimates are still pending, the prospect for lots of new housing construction are good if SB 827 passes later this year.